Officers saved congressmen during shooting: I am involved in many events and interactions on Capitol Hill which are never mentioned in the Chairman’s Report, for lack of space. It takes a lot of space to report on our programs in the Middle East, and on the difficulties of moving Congressional bills such as HR-390 to help persecuted Christians. For the most part, I feel that you would probably rather hear about what the Religious Freedom Coalition is accomplishing, than to hear about the various prayer meetings, social events and award ceremonies I must attend and be part of. Yet these events are important, in order to keep a high profile for our work on Capitol Hill. 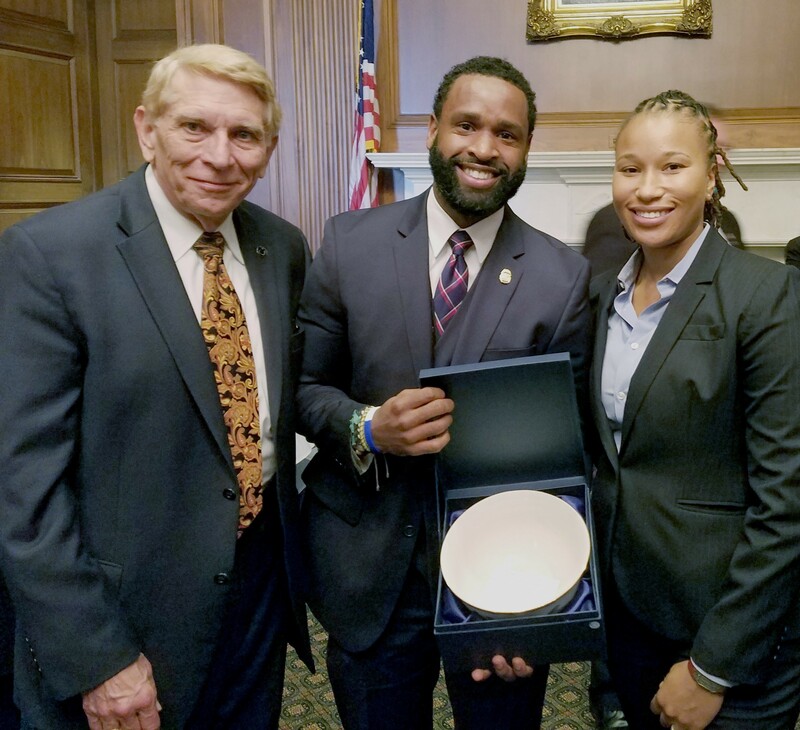 One of the events I was recently a part of was the presentation of the Policeman of the Year Award by the Capitol Forum Club. This is a Club which has met for breakfast inside the Capitol Building for decades, and for the most part is made up of retired generals and admirals. Their award is given to a Capitol Hill police officer each year. This year the honor went to two officers who undoubtedly saved the lives of numerous congressmen, by engaging in gunfire the far-left gunman who targeted Republican congressmen as they practiced for an annual charity baseball game against Democrat congressmen. Both recipients of the award, Capitol Police officers David Bailey and Crystal Griner, were wounded during the shooting. Special Agent Griner was still using crutches as she accepted her award. The awards were given after a special breakfast in the historic Mansfield Room of the Capitol Building. It was my great honor to meet not only these officers, but the Chief of Capitol Hill Police, Matthew R. Verderosa who has been in law enforcement for 31 years.